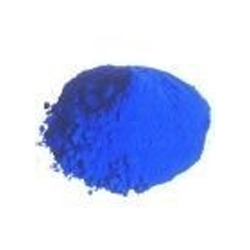 Providing you the best range of lake brilliant blue fcf and direct blue dyes with effective & timely delivery. Available in 3 grades of Dye Content: 11% -20%, Dye Content: 21% -30% and Dye Content: 31% - 40%, Lake Brilliant Blue FCF offered is from the family of direct dyes and find use in areas like cellulose fibers like linen, rayon, cotton. Further, the dye comes with advantage of being light fast which makes it resistant to fading in light. Further, its superior constitution quality also makes it easy to use in defined dyeing applications. With a purity of 100 percent, these Direct Blue Dyes find use in areas like Leather, Paper dyeing, Textile Dyeing and other applications. Available with minimum order quantity of 500 Kilogram, these are commonly used on cotton fibers as well as can also be mixed with all purpose dyes along with acid dyes. The advantage this dye provides for includes offering superior light fastness as well as usage possibilities in same dye bath with acid dyes. Available in pure constitution form, these dyes apart from cellulose fibers also provide for suitable support on stain silk and wool fibers.